G&G Commerce, Ltd. (domeggook.com), which operates an online B2B open market (domeggook.com), participated in Chinese Children's Welfare Service (whet.org.cn), and donated "YELLY MAT", an infant mat that is cooperating with domeggook.com for marketing in Chinese market. The event was hosted by the KOTRA Qingdao Trade Center and the China Weihai Importers' Association. Shandong province XinDaDong, Weihai Fangzheng Global, and Weihai RuoYaJin Chukou, was participated in this event as a Chinese side, and G&G Commerce, Ltd. (domeggook.com) was the only Korean company. Since 2009, G&G Commerce, Ltd. has been carrying out social responsibility and fulfilling its corporate social responsibilities by seeking neighbors and society alienated in abroad. 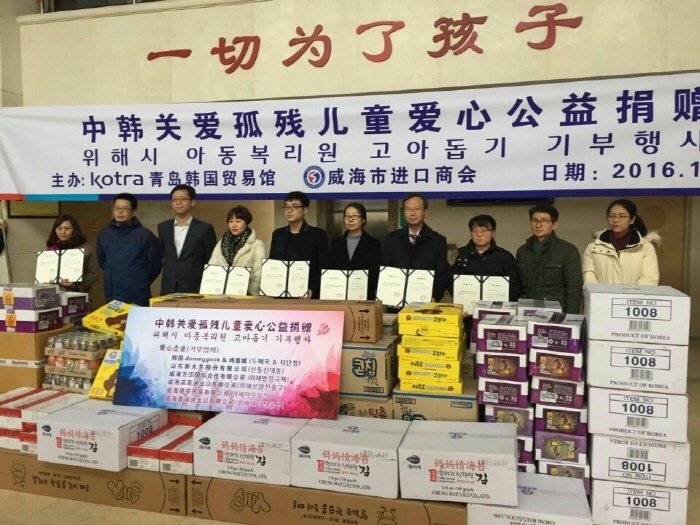 Yeong-Il,Mo CEO of G&G Commerce, Ltd. said, "With more than 1.5 million wholesale merchants paying commissions of 3 ~ 6.3% and we are using a portion of our income for domestic and overseas social contribution activities under the name of "domeggook members’ support". We will continue to do more in the future. " In addition, G&G Commerce, Ltd. was carrying out various social contribution activities such as donating youth scholarship, sponsoring social events, sponsoring cultural events, sponsoring college students, supporting hospitals and nursing homes, and sponsoring a sharing concert to prevent suicide of teenagers. With international NGO organization called WorldShare, G&G commerce has been participating various international CSR activities such as supporting children living environment improvement projects in Southeast Asia, supporting Nepal Earthquake Recovery, and establishing wells for improvement of drinking water in Cambodia.